If Indian mythology was a character, "My name is Mythology, Indian Mythology" would have been quite popular. When we talk about Indian mythology it is as varied as the country itself and unfolds an interesting chapter every single time you dig into reading something. If you are wondering why I am writing about these traditional narratives, then you will understand as you read ahead. I recently read The Curse Of Brahma, volume 1 of Krishna Trilogy by Jagmohan Bhanver who has previously written three bestselling non-fictions before getting this novel published. The primary reason for me to pick up the book for reading was the blurb while the title was equally intriguing, but the problem with books that relate to Indian mythology is that sometimes they overdo and deviate a lot from the main subject however I was glad that The Curse Of Brahma isn't one of those. The Curse of Brahma as the name of the book goes, it is about the curse that turned one of the most disciplined and learned pupils of Lord Brahma into the Dark Lord, whose aim is to destroy all three worlds (Aakash lok, Mrityu lok, Paatal lok) and take the revenge of him being punished by the curse of Brahma. Amartya Kalyanesu aka the dark lord who lived with the curse for more than 200 years plans his vengeance and with a group of deadly monsters starts taking over people from the mrityulok (Mortal land). 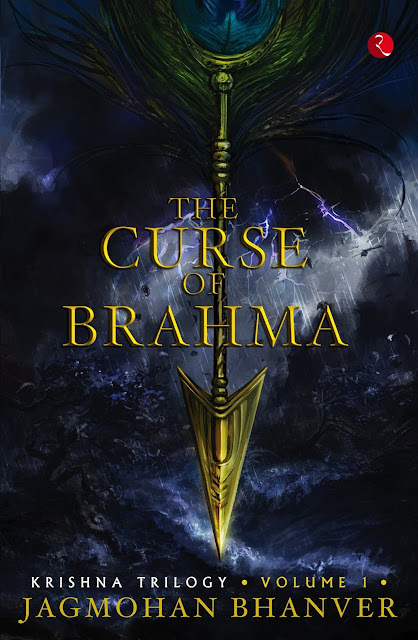 The Curse of Brahma starts from the childhood days of Kansa and as a reader, you explore the good side of him, it is only after he becomes a prey to the Dark Lords vengeance plan that his evil side is seen. Cutting short, everything, this first part of the trilogy is all about the story before Krishna is born. All the character in The Curse of Brahma right from Devki to Kansa, Vasudev to Surasena, etc.. are very well defined and with 21 chapters the narration of the story is good but could have been better. I felt it was stretched a bit more and could have been 30-50 pages less. The language is very reader friendly and I could visualize the scenes and conversations between different characters and my favorite being the conversation between Lord Shiva and Lord Brahma. I will recommend this book to anyone who is interested in reading mythology, especially Indian mythology. Publication: Rupa Publications India Pvt. Ltd.